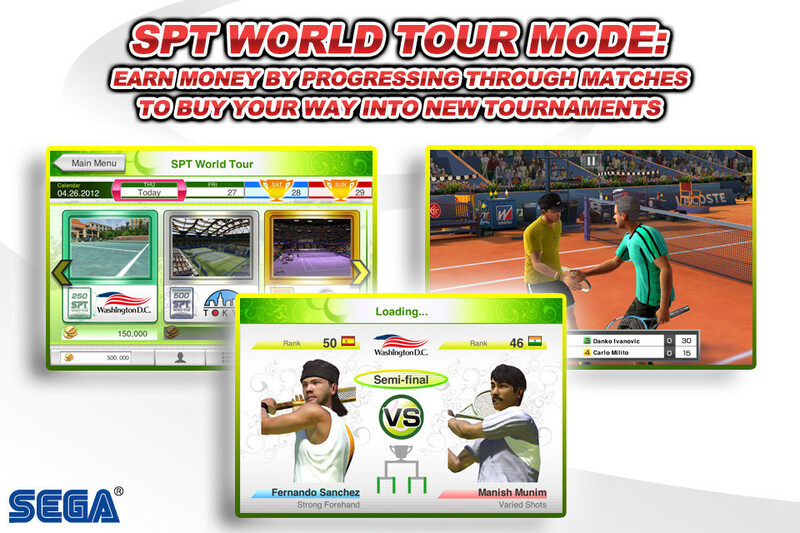 Fernando Sanchez is Virtua Tennis Challenge’s (Free) Rafael Nadal doppelgänger. So whimsically named after barely winning out against Brafael Nadalf in an interoffice poll, Bizarro Nadal quickly became my player of choice in the iOS version of Sega’s classic tennis series. Sanchez, like Virtua Tennis Challenge, is a pretty good facsimile of the real thing. He’s fast and has an incredible two-handed backhand, but he’s a facsimile all the same. A half-hearted attempt at greatness, poor Fernando’s Plasticine mullet and vacant zombie eyes are analogous to the lack of care Sega has given this, the newest entry in one of its most revered franchises. Jarringly, disappointment and confusion set in from the get-go. Tennis games thrive on the simplicity of input, the best examples (Top Spin, Mario Tennis, some game called Pong) being the classics that make the simple act of swatting a ball back and forth enjoyable. What better platform then, than one that lets you accurately swipe your finger through the ball, right? Not so much. The gesture-based touch controls are terribly frustrating and inaccurate, with an unnecessary two-fingered power shot mechanic. I could barely place in one of the game’s three daily tournaments using touch inputs. Luckily, I didn’t have to. Tucked away in the options menu are three alternative control methods, all of which are leagues better than the game’s default touch scheme. Mostly differentiated by their cosmetic characteristics, you can choose between arcade, virtual pad and game pad inputs. The virtual pad was the one I settled upon, with a Nintendo DS-style nub on the left side of the screen for player control and placement, and buttons up the right edge of the screen for shot types. 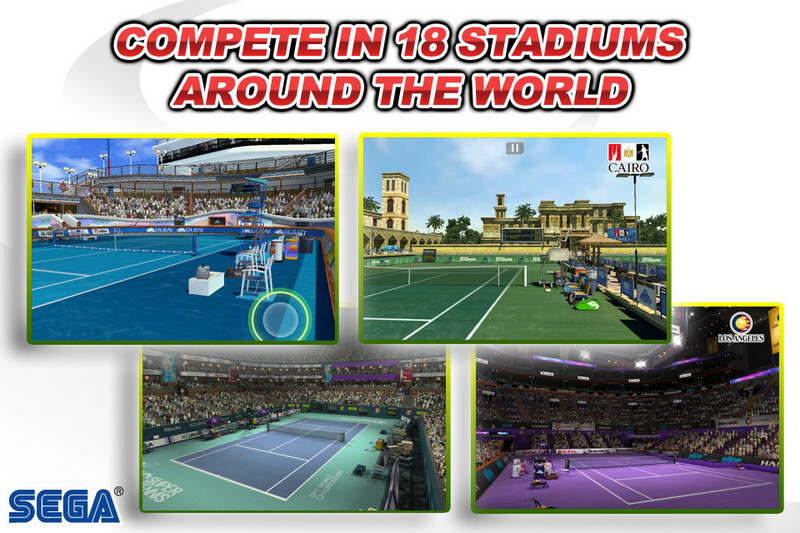 It transforms Virtua Tennis Challenge from a hot mess into what is the best-playing tennis game on the iPhone. You’ll soon be gliding around the court with ease, smashing home your third consecutive ace, or closing out a set with a venomous slice up the line. The accessible, skillful play the series is known for, rediscovered. And, like me, the entire time you’re briskly working your way to the top of the world rankings you’ll be thinking to yourself, “Why isn’t this the default control scheme?” It’s one of several questions I had during my time with the game, one of which included how it managed to ship with such serious performance problems. On anything less powerful than an iPad 2, the game suffers from severe frame rate drops and loading issues. On my iPhone 4 I witnessed my FPS drop well below thirty, with severe load times and stuttering during menu transitions. I’m not overly sensitive to drops in frame rate, so it didn’t have a markedly negative impact on gameplay, but it does the online no favors. The online, which, for all intents and purposes, does not work. Matches are unbearably laggy and I suffered repeated disconnects over a handful of networks during my tests. While one hopes Sega will fix this in a future update, it’s incredibly detrimental to the game’s longevity as an already bare bones port. Bare bones because, as mentioned, the game has the three daily tournaments to participate in, along with exhibition matches, challenge duels which are essentially fluffed up exhibition matches and a better off ignored tutorial. That’s it. Sans the arcade-y challenges the series is known for, any meaningful character customization or a working online component, there’s little to hold your interest past a few quick rounds of what’s actually some very good tennis. My dear friend Fernando Sanchez is the product of Sega’s unwillingness to shell out for player licenses for the iOS version of their flagship tennis game. It’s a mentality that carries over to the rest of the game, a neutered effort and a disappointing lapse for one of the few large publishers with a deft hand for doing typically console and PC-centric franchises well on the platform. 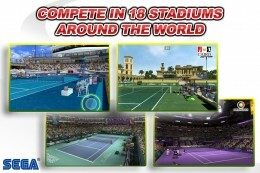 What’s there is fun, but at five dollars it’s difficult to support Sega’s apparent decision to treat Virtua Tennis Challenge as an afterthought. We deserve better. So does Fernando.